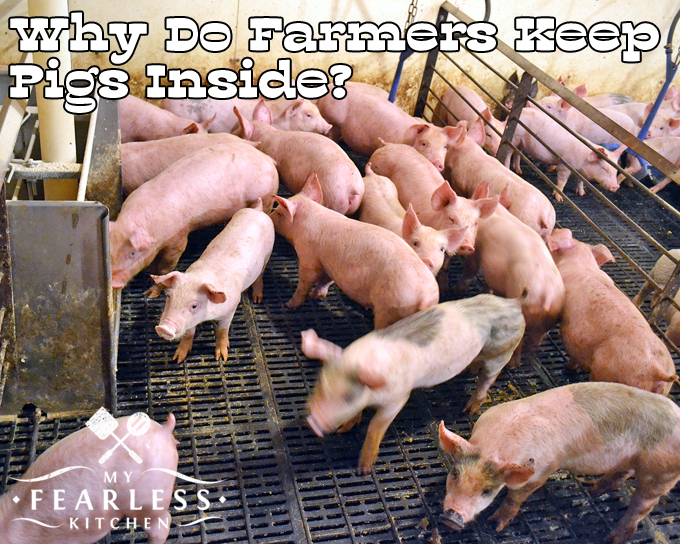 You are here: Home / About Farming & Food / Why Do Farmers Keep Pigs Inside? 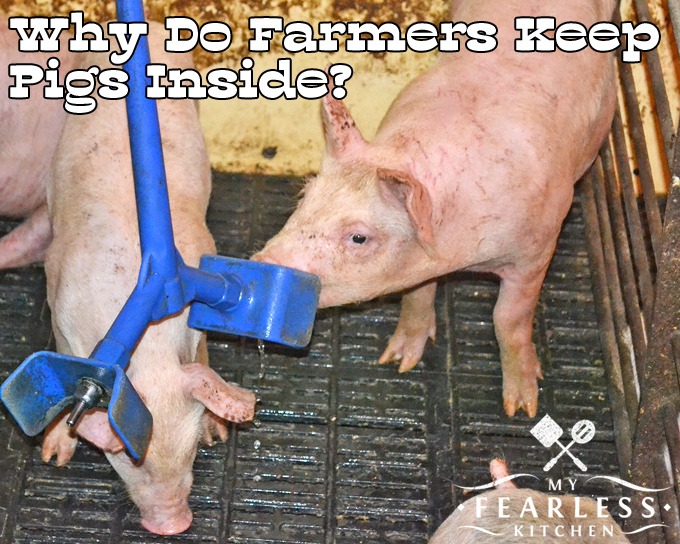 Why Do Farmers Keep Pigs Inside? Most pigs are kept inside barns. Pigs need to be kept at just the right temperature to be comfortable. If it’s too hot or too cold they can quickly get stressed and sick. 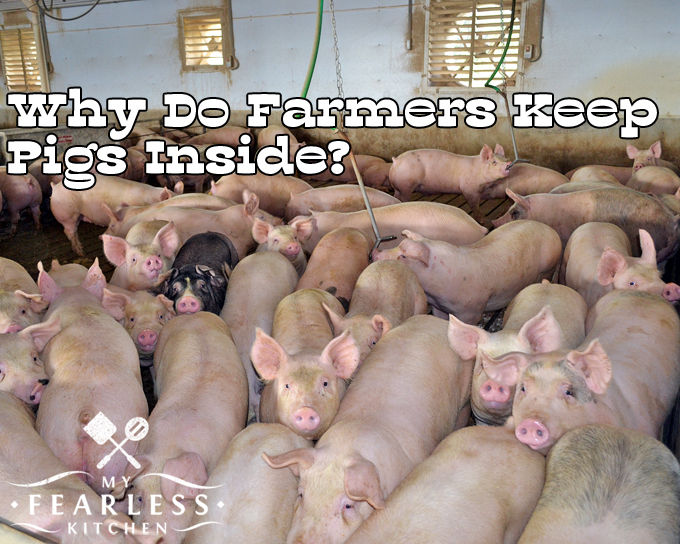 Keep reading to find out how farmers keep their pigs comfortable and healthy. Pigs are very sensitive to temperature. They can’t sweat like people can, so it’s important that they stay cool enough in the summer. They also don’t have thick hair coats (like these beef cows), so they need to be kept warm in the winter. This is one reason that pigs are kept inside barns. Different ages of pigs do better at different temperatures. Separating pigs into a farrowing barn, a nursery barn, a finisher barn, and a gestation barn means that farmers can tailor the temperature to how each group of pigs likes it best! What Happens to Piglets After They Are Weaned? When the piglets are three weeks old, they are weaned and moved from the farrowing barn into the nursery. The piglets are vaccinated against diseases that cause pneumonia. Piglets are also vaccinated against influenza, which can cause coughing, sneezing, pneumonia, high fevers, and abortion in pregnant sows. In the nursery, the piglets are grouped by size. Each nursery pen in this barn on Heather’s farm can hold up to 20 piglets. Piglets from different litters may be put together in the nursery pens. They are kept in the nursery until they weigh around 50 pounds, or are about 10 weeks old. The pigs are automatically fed into the group feed trough twice a day (on the left side of the photo above). All the pigs in the nursery will eat the same type of food, but depending on the sizes of the pigs, some pens may get more food than others. Each pen has two water spouts that the pigs share. The water lines run along the ceiling, and water spouts hang to the height of the pigs’ backs. These spouts are similar to a hamster bottle. The pigs quickly learn how to press the spout to get water. One other thing you may notice in the photo below is that the pig on the right has some scratches on his back and shoulders. When the pigs are first put together, they will fight a little among themselves to figure out which pigs are in charge in the pens. This is normal behavior for pigs. Once these 20 pigs get their “pecking order” sorted out, there is very little fighting. The nursery is kept very warm at 80 degrees. As the pigs grow, the temperature is gradually lowered to around 70 degrees. Pigs need warmer temperatures to be comfortable when they are younger and smaller. As they get older and bigger, they are more comfortable at slightly lower temperatures. 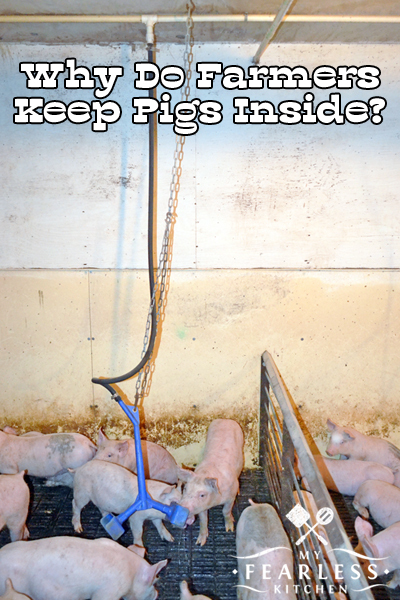 Once the pigs grow to around 50 pounds, they are moved to another barn called the finisher. Here, the pigs are kept in large rooms that can hold up to 250 pigs. Each room is divided into 4 large pens. The pigs are grouped by size again, so the smallest pigs are not competing for food with the biggest pigs. The temperature in this building is kept right around 70 degrees. Each room is all-in/all-out, which means that the entire group of pigs moves together, and no new pigs are brought into the room. When the pigs are grown, they all leave the room together. When the room is empty, it is cleaned and disinfected before a new group of pigs is moved in. In the photo above, you can see that many of the pigs in this pen came over to see what we were doing on our barn visit. There are also pigs at the feeders to the left of this photo. The finisher pens have the same type of water system as the nursery pens – you can see the green water lines with spouts hanging down into the pens. When the pigs reach about 280 pounds, they are sold. Most of the pigs from Heather’s farm are sold to Tyson, and their meat ends up all over Indiana. Just because you’re buying pork at Walmart doesn’t mean it’s not local pork! 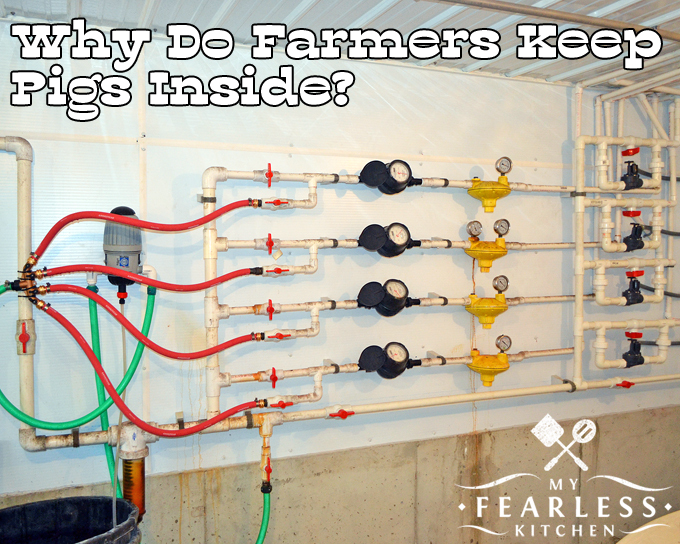 How is the Temperature Controlled in the Pig Barns? Each barn has a “control room” which houses all the controls for the water lines, automatic feeders, and ventilation. This barn has four finisher rooms, and a separate water line for each room. Every day, someone checks the water pressure for each line, the water spouts in each pen to be sure they are working, the feed levels in each automatic feeder, the feed amount setting for each pen, and makes sure that the automatic feeders are working. The automatic feeders are on timers, and the ventilation systems have thermostats so the rooms stay at a constant temperature. You can read more about how Heather’s family keeps their pigs warm in the winter here. Intake fans and temperature-controlling curtains are just as important as the exhaust fans for ventilation. Each room has curtains that are on separate automatic controls, so if one room is starting to get too warm, the curtains can be lowered to let in more air. In the summer, these curtains are kept open to allow a constant flow of fresh air. 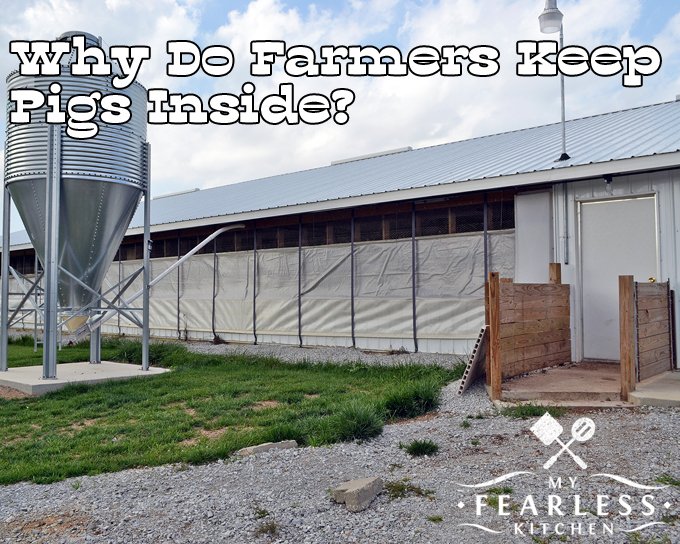 The ventilation fans and the curtains work together to keep the pigs at a comfortable 70 degrees, whether it’s 100 degrees or 10 degrees outside! And have I mentioned that this farm doesn’t smell like pigs? 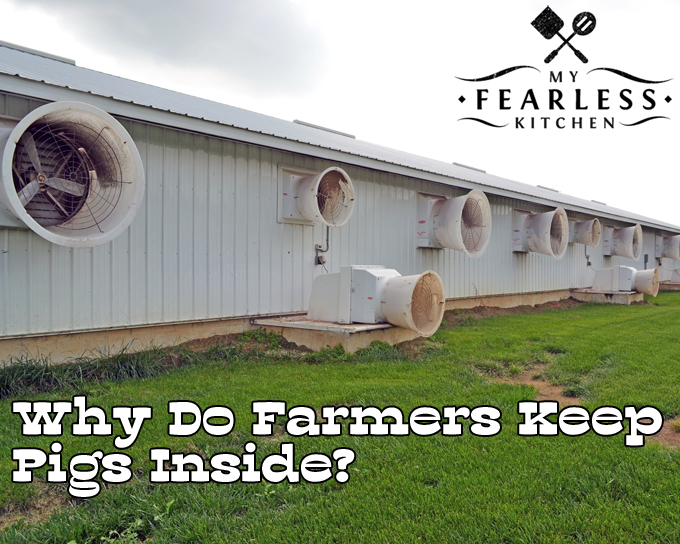 The ventilation system in the barns and the manure pits keep fresh air circulating and keeps the farm from smelling like pigs! When you go into the barns you do notice the smell, but once you’re outside (even with the curtains down) you can’t smell the pigs. I am interested in information/guidelines towards establishing a modern piggery pen & poultry outfit in Nigeria. Hello my name is Sarah and I am writing a paper on the design of the anaerobic lagoons used in pig farms. To calculate the amount of waste produced about how many days do the pigs stay in the finisher farm? Sarah, sorry for my late reply. I hope this still helps you. The piglets are in the farrowing house for 3 weeks, in the nursery barn for 7 weeks, and in the finisher barn for 16 weeks. What do you think is the appropriate size for a nursery? It depends on how many pigs you have, or plan to have. I suggest you contact your local extension office for some more guidelines. I LOVE your article!! It’s very informative. My husband and I are trying to research swine farming but we are only interested in the finishing barn. We want to buy already weaned 50lb pigs. My question for you is that I didn’t see how they sleep in the finishing barns, do they have a sleeping area or place to lie down with hay? I saw the flooring how it allows all waste to drop down, how the water works, how the feeder works, but nothing on sleeping. If it’s not too much to ask can you send my pictures of their sleeping area so I can see the FULL set up? Also how much would you say feed costs for each room of 250 pigs for their whole stay from 50lbs to 250/280 lbs. sorry for all of the questions and thanks in advance!! Hi April, thanks for your questions! The pigs in this barn do not have a separate sleeping area. They are quite comfortable on the floor. If they had any bedding in the pens with them, they would tear it up and toss it all over their pens. As far as feed costs, that is going to vary greatly depending on your location, what you plan to feed, and even the grain markets from year to year. Your best bet to get an estimate for feed costs would be to talk to a swine nutritionist in your area. You’ll need a nutritionist anyway to help make balanced rations for your pigs.